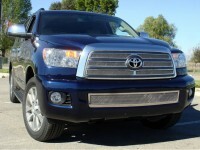 54902: 08-16 Toyota Sequoia Four Piece Stainless Steel Mesh Grilles. Easily upgrade your Sequoia with this multi piece custom grille. Made from top quality pure stainless steel, these grilles come finished in a chrome finish and are guaranteed never to lose their shine or deteriorate in any way. Easily installs into each opening in the OE factory grille. Comes complete with hardware and installation instructions. Install time is about 1/2hr. 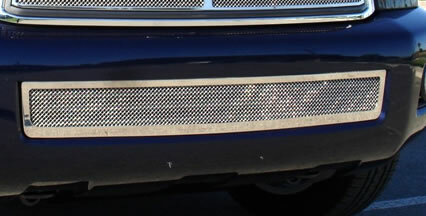 Matching bumper mesh grille is available above as additional item. (Bumper grille does not work with Road Sensing Cruise Control system.) Backed by manufacturers lifetime warranty. Made in USA. Tell your friends about the Upper Class Stainless Steel Mesh Grille (4pc). Share this product on Facebook, Twitter, MySpace or send an email to a friend!